Put away the chips and dip, when Micro Monsters hits the table, they really hit the table! Alien token flipping fun! In Micro Monsters, players lead a unique army of alien creatures that have “gated” to a playground planet: Ares. In this dexterity-based game, players must shoot their alien tokens at their opponents’ Gate in an attempt to close it. The last player whose Gate remains open is declared the winner! But each race has a special ability that may turn the tide of battle in this simple but challenging family game. After players choose one of the four unique alien races, and take all their components, the alien landscape of the Planet Ares is prepared! Players put their Gate token in the table in front of them with the undamaged side face up. Then players place their micro monster chits all around the gate no more than five inches away. Players also take two Energy Tokens and their special Die and place them to the side. Play is about to begin! Youngest player goes first and rolls their die. If the die shows a monster then that player may use their monster shooter to flick a chit of that type toward one of their opponent’s Gates. If the die shows the special ability symbol, that player may activate their races special ability! Depending on the race a player chooses, special abilities may allow them to move two monsters during their turn, move one monster twice and even trap another monster so it can’t move! But everything depends upon where your monster chips lands! After flicking a monster with a monster-shooter, if it lands on an enemy monster it is “Squopped” or removed from the game. If the monster chit landed on an enemy’s Gate, the monster returns home and gets placed within 5 inches of it’s home Gate. Then, the player who owns that gate discards one of their energy tokens. If they have no more energy tokens, they must turn over their Gate marker to the “damaged” side. That’s dangerous because if an enemy monster lands on a damaged gate, and that player is out of Energy Tokens, they are out of the game! Players take turns in clock-wise order until only one Champion of the Planet Ares remains! Francesco Mattioli has created some very charming aliens for the game; very appealing, especially to the youngest of players. The chits must be stickered so over time there is a chance of the decals wearing off, but they did hold up after half a dozen games with little or no damage at all. Components are sturdy! A game for ages 6 and up, the game is easily taught and played by this age group – and perhaps even younger depending on your child’s development. Micro Monsters is a very light game with no reading skills required. The almost completely visual game relies on a steady hand and some patience as chits are flicked across a table. Not a deep game, but excellent for teaching the very basics of game play: turn, order, patience and sportsmanship. 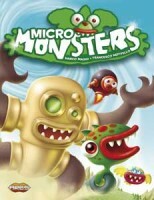 Micro Monsters is especially good to play with young children but does need adult supervision. This is due to the unpredictable way the chits can be launched and in general, the free style way the game plays out. Also the way the chits land may be contested a bit and unintentionally, or intentionally bumped. An adult is needed to see that these don’t escalate into arguments and that all play is fair. So if you are planning to play the game with your young children ages 6-9, here are some tips. A large table is needed for this game, simply because anything as small as a card table (3×3) will have Micro Monsters flying around the room. The rulebook suggests a good tablecloth to play on. This is good advice. Some tablecloths work well for this game, (cloth) others not so much. So test the game out on the table you want to play on. Otherwise the play session will be spoiled. There is no need to read the rulebook to the smaller children – simply set the game up, give each child a die and a shooter and start playing. For the youngest of players, keep some veggie snacks on the table (away from the battlefield). When it is not their turn, children can grab a carrot stick. This keep little hands occupied and less tempted to “fiddle” with the cute monsters during other players’ turns. Dice rolling – since the position of the chits is vital to the games outcome, make sure that younger players roll the die with one hand and shield the other play pieces with the other. No rolling over the Micro Monsters! Micro Monsters provides a simplified version of the game Tiddlywinks (Patented in 1889 and all the rage in 1890). And it is actually trimmed down version of a 2007 Fantasy Flight Games game called Micro Mutants: Evolution. The original game of Tiddlywinks was steeped in strategy with lots of unique terms to describe the actions players and their chip; being able to capture and eliminate opponents’ winks as well as score your own and opponent’s pieces by them by shooting them into a pot. In the same manner, Micro Monsters gives players choices in their strategy for eliminating the other players by “squopping” (one traditional term that survives in this game) their monster chips, and aiming for their Gate in order to eliminate that player from the game. But a purely dexterity based game can be one of the best experiences for children or one of the most frustrating. (And frustrating for the parents as well). Micro Monsters is more challenging than some dexterity based games. The chips are small; they can fly and land unpredictably (Well, that’s the whole challenge isn’t it?) and as the rules state, a good tablecloth is key in getting your monsters to travel and land with accuracy. It really does take some practice to get the right action on the chips. Younger children (and some adults) may display a lack of patience in not hitting other chips or the Gate, especially in games with fewer players. The key is go for the Gate – it’s the largest target and will get a player closer to victory. Landing on another players monster chip is just a random occurrence. Younger children may want to flick the monsters out of turn, so in this game, patience may be the hardest rule to learn. Also, player elimination is only fun for the players that stay in the game, so some care and explanation may be needed if and when your children are eliminated. All this said, Micro Monsters can provide a unique and fun game experience. It’s easy to set up, get playing right away and the look and feel of the game will attract the junior players. And as with most games for children under 8, deviating from the rules a bit, or even letting the youngest of players scoot or toss their chips may even things out. The key is to approach the game with a modicum of patience, versatility and humility. And as player elimination may not go over well with some younger players, the ability bend the rules when necessary will allow the full enjoyment of the game. Four armies of alien micro-monstrosities clash in a challenge to the last jump! In Micro Monsters, four races of horribly cute aliens – Autogators, Bigbears, Finbacks, and Turboturtles – face off, with each race wanting to close the rival monsters' dimensional gates. Using dexterity-based game play similar to that in MicroMutants and X-Bugs – and more commonly seen in Tiddly Winks – players in Micro Monsters "shoot" their monster tokens across the playing area by pressing on one edge of them with a "monster shooter" to send them flying. Land on an opponent, even with the tiniest bit of your monster, and you capture that opponent's token, removing it from play. Land on an opponent's gate, on the other hand, and you remove one of that opponent's energy tokens; take an opponent's final token and she must flip her gate to the damaged side. Land on a damaged gate, and that opponent is out of the game! Add a Review for "Micro Monsters"